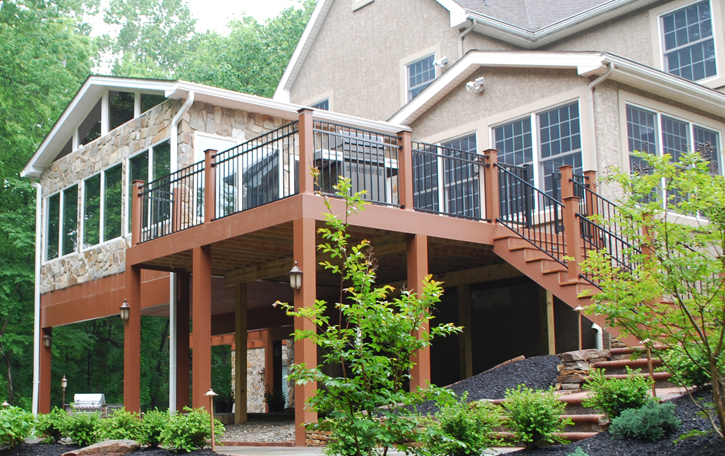 When it comes to an outdoor living space, elevated decks are often the best design choice for many types of homes and lots. A deck, unlike a patio, can adjoin divergent planes. 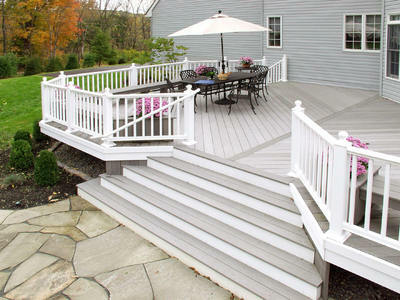 Decks can be built to go ‘up, down, over, under and around’. So if your home’s design and landscape necessitate an elevated deck, what’s the best way to manage the leftover space underneath? Essentially, there are four options for the space beneath: an open area with groundcover, enclosed storage area, underdecking for an open outdoor room, underdecking for a screened-in room. The area directly below an elevated deck is very shady and grass won’t grow. Groundcovers work well no matter the clearance between the deck floor and the soil. But if the gap is only a few feet, a grass/plant alternative is likely to work best if you want to leave the space open. The least expensive option is mulch; however, this may need to be refreshed yearly. A more permanent and low-maintenance solution is stone. And decorative gravel or rocks are available in a wide variety of colors and sizes. To really polish-off the space, layer the deck perimeter and footings with hassle-free native flowers, hardy plants or taller evergreens for privacy. Include larger rocks or a stone pathway as part of the landscape design too. Storage is another fantastic option for the space under a deck. Built-in storage puts otherwise wasted-space to good use. One essential consideration is air circulation; however, an experienced contractor will have the know-how to ‘do it right’. The space will need air. If the area is very low to the ground, skirting panels can be built with hinges or hooks to allow access to stored items. On the other hand, if the area is taller, a door with a lock can be designed. A lockable storage room is fantastic for stashing wheelbarrows, garden tools, kids toys and seasonal items. Ramp up the convenience-level with lighting. Use weatherproof storage bins with wheels to organize the small things. 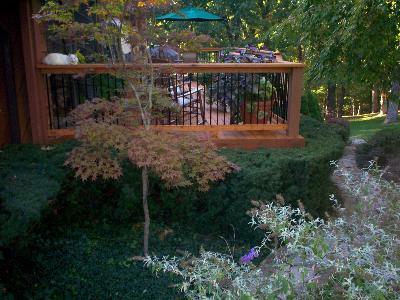 An elevated deck built with underdecking essentially doubles the outdoor space at an affordable price. Sometimes called ‘rain decking’ or ‘deck guttering’, the area below the floor will be protected from the rain and therefore dry and usable. But what exactly is underdecking? It’s an all-in-one roof, ceiling and drainage system installed underneath the deck framing. When it rains, water will drip between the deck floor planks but with underdecking, the water is captured and diverted away from the structure. And Voila! You have two outdoor spaces in the footprint of one! When it comes to under deck screened rooms, the benefits are endless. Depending on the specific panel used, the ceiling may resemble beadboard with a flat surface or the ceiling may have the look of rafters with depth and dimension. Either way, the space below the deck can be outfitted with indoor amenities for complete convenience and comfort. 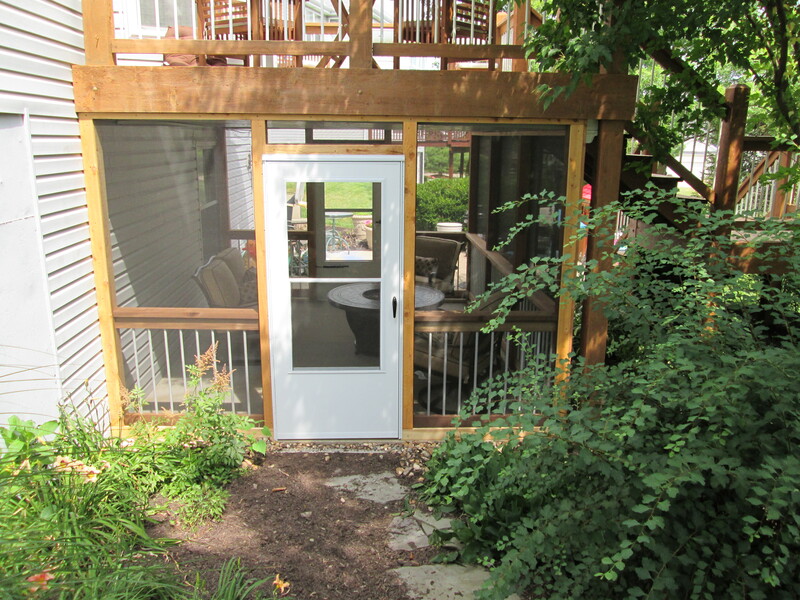 And best of all, an under deck room is much less costly than a traditional screened-in porch. We’re fans! 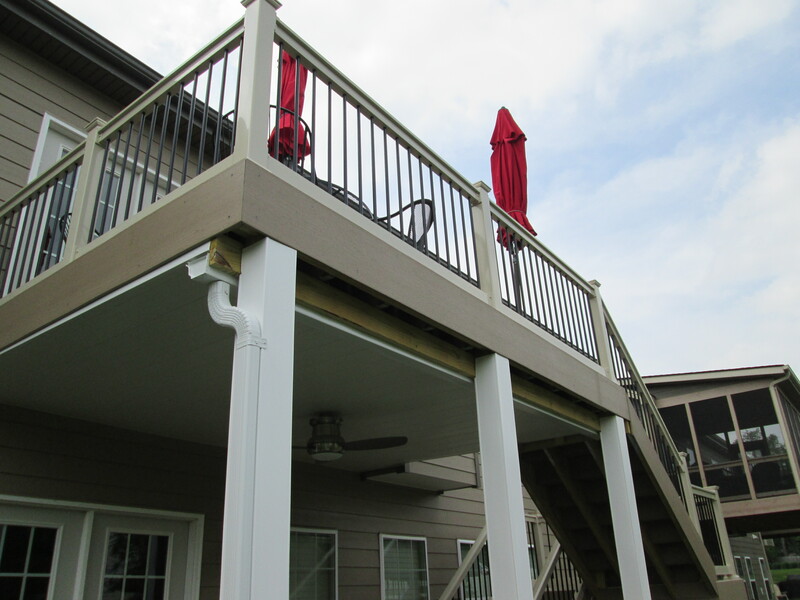 Don’t waste the space below an elevated deck. It’s valuable. If you prefer that the area remains open, simply add mulch or stone and a little landscaping to polish-off the deck perimeters. Consider enclosing it for storage, no matter the height. Lockable doors or panels with hinges and hooks can make the spot accessible. Underdecking hides the unslightly underside of a deck and creates two usable outdoor spaces without taking up more of your yard. An open or screened-in outdoor room below the deck can be included in the original design or added to an existing deck, later. 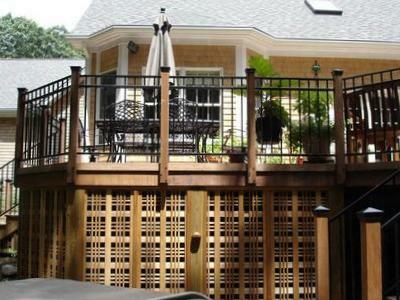 Under deck screened enclosures are one of the most popular outdoor living spaces for homeowners. They’re functional, versatile and cost effective. If you’re still exploring ideas, visit our website or new Pinterest Page to see hundreds of photos. On our Pinterest page you’ll also find other great resources. If you reside in the St. Louis Missouri area and are ready to talk about a project you have in mind, please consider Archadeck. We serve the entire metropolitan region including St. Charles and parts of Illinois. We’re locally owned and operated and we offer free consultations too. Just call us anytime, 636-227-0800 or fill out an online inquiry form. Outside of St. Louis? Go to archadeck.com to find other locations, nationwide.